Come folks, let's be realistic. The Dems elected Obama by totally wiping out his past, and still to this day totally ignoring it. But they won't be so kind to Romney. They've already started laughing at Romney and rightfully so, because every criticism he has of Obama is like a freak'n boomerang, he can't utter the words without total hypocrisy (and they have the tapes.) 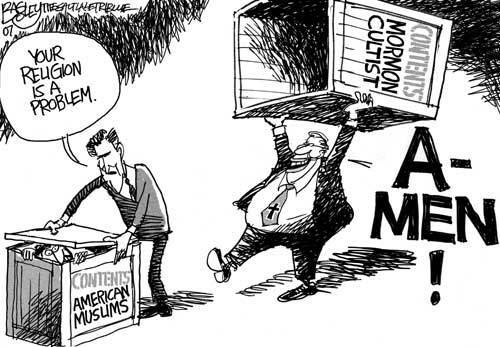 Plus they have already started going after him for his cult religion. And that's the way it will be if he is the nominee. 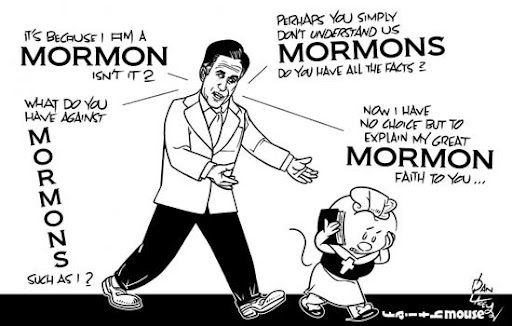 Every lie and fraud that is Mormonism, every false historic claim, every blood oath, every person murdered because of blood oaths and all the rest is going to be front and center. Do you honestly think a man with THIS baggage stands a chance?